Love In The Moonlight breakthrough actor and one of South Korea’s youngest superstars Park Bo Gum encounters his Filipino fans live at his first ever fan meeting on April 27, 2019 at the Mall of Asia Arena. 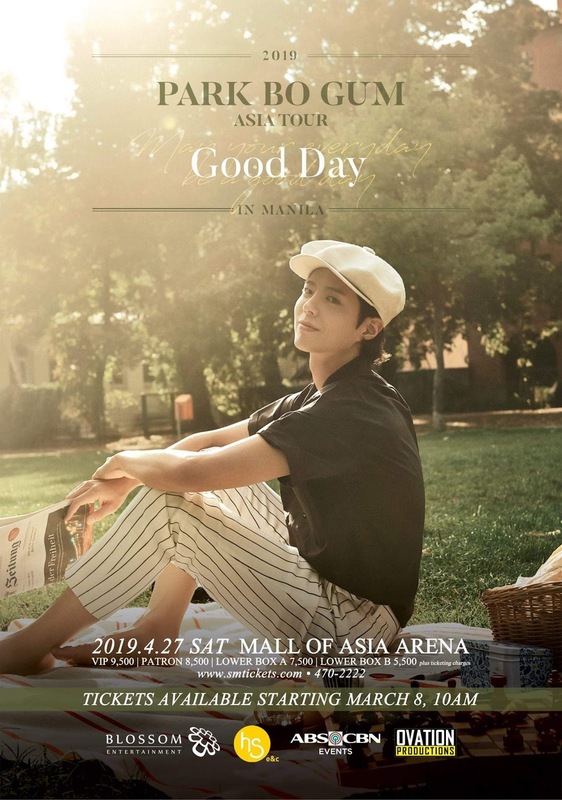 The Philippines is the most recent addition to Park Bo Gum’s 2019 Asia Tour: May Your Every Day Be A Good Day. The much anticipated tour kicked off in Seoul last January, and Manila will be the eighth and final stop, concluding the round of shows in Asia this year. Park Bo Gum jumpstarted his career in the entertainment industry by debuting as a supporting actor in the thriller film Blind (2011) and landed his first major role in the weekend series Wonderful Mama (2013). His next feature, The Admiral: Roaring Currents (2014), was a box-office hit becoming the highest grossing Korean film of all time. Park also played scene-stealing roles in Hello Monster and Coin Locker Girl, gaining rave reviews from audience and critics. In 2015, Park Bo Gum’s role as one of the leads in hit TV series Reply 1988 had been a vital element to his road to success. The show broke many records and was hailed the highest-rated Korean drama in cable televison history, catapulting Bo Gum to a fast-rising Korean Wave heartthrob. By 2016, playing his most popular role to date, the Joseon crown prince in historical drama Love In The Moonlight, earned him a number of accolades, including Top Excellence at the KBS Drama Awards, Most Popular Actor for Television at the Baeksang Arts Awards, and Outstanding Korean Actor at the Seoul International Awards. This notable portrayal officially cemented Park Bo Gum’s status as one of Asia’s most versatile actors and skyrocketed him to A-list Hallyu stardom. Park eventually became the youngest artist to be named Actor of the Year by Gallup Korea and rose to No. 1 on Forbes Magazine’s Korea Power Celebrity list. Global brands voted him Top Celebrity Endorser of 2017 and led to him being Korea’s torchbearer at the 2018 Winter Olympics. With all this worldwide recognition and new TV drama Encounter to be aired soon on ABS-CBN, Park Bo Gum is only getting started.